Guests, attired in white, mingled before the start of the 'Rock in White' party. 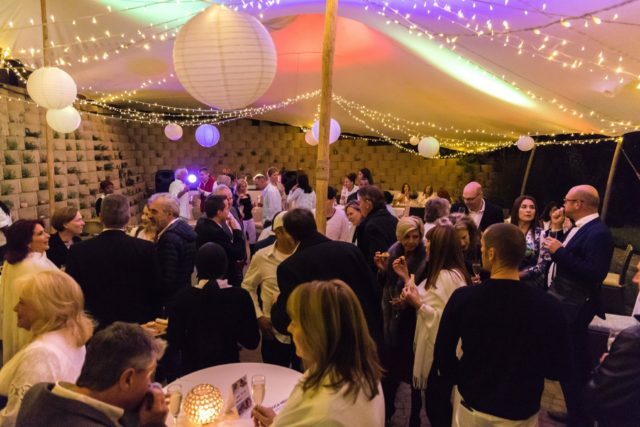 On Friday, 27 July, friends and supporters of the Franschhoek Hospitality Academy came together for a sensational evening at the academy’s ‘Rock in White’ fundraiser held at ROCA Restaurant. ROCA’s team were phenomenal from the start, working closely with To-Netts Décor to add beautiful touches to the venue, which only enhanced its already eye-catching ambiance. Guests arrived in white and were ready to dance the night away with the Uncorked Band, who stole the show and put on an exceptional performance which was enjoyed by everyone in attendance. 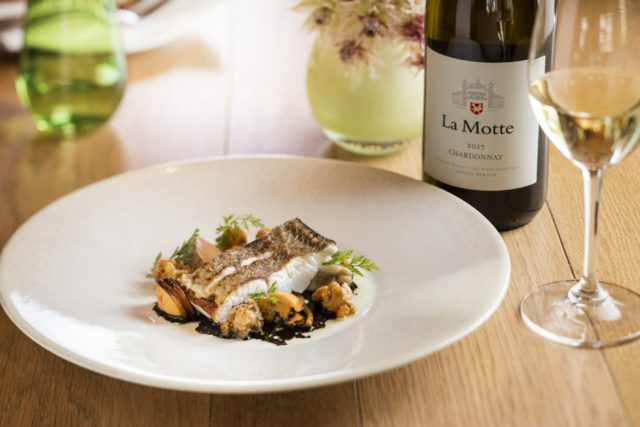 Expect a fresh interpretation to the acclaimed wine and food experience on Franschhoek-based La Motte Wine Estate. With an eye on global culinary trends and embracing the signature modern focus of newly appointed executive chef, Eric Bulpitt, Pierneef à La Motte Restaurant is shining a new light on heritage cuisine. 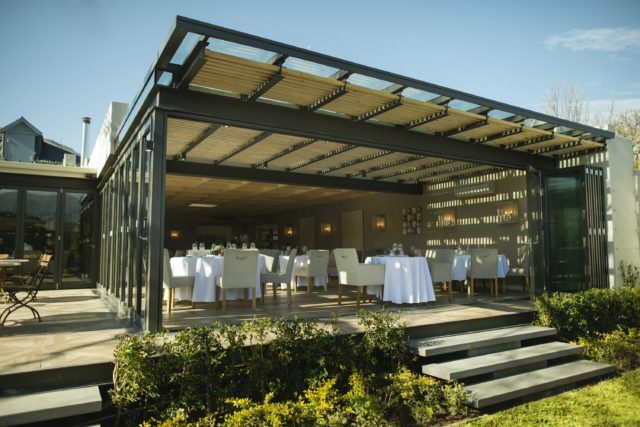 Since opening its doors in 2010, Pierneef à La Motte has been renowned for its exceptional cuisine, innovative wine experience and authentic Cape Winelands hospitality. 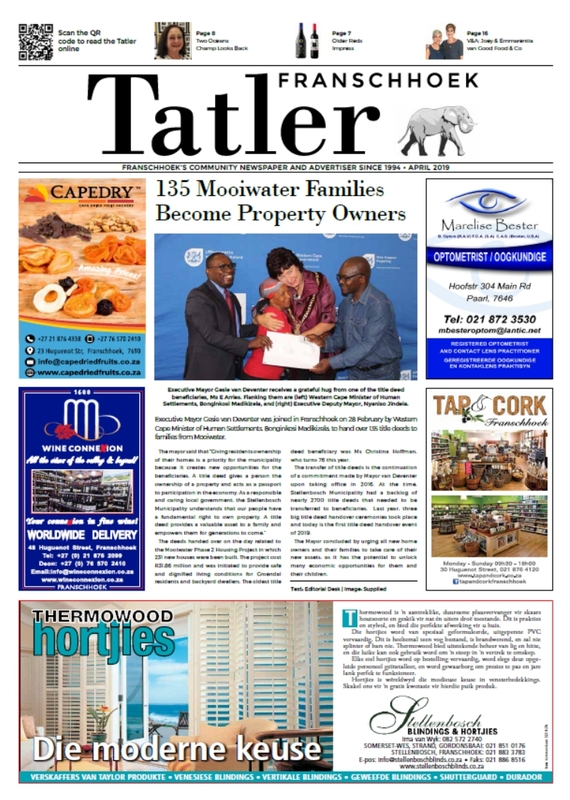 “We are passionate about our heritage and in keeping with the international trend, the focus at Pierneef à La Motte Restaurant will stay on heritage cuisine and an authentic food experience. It is, however, time for a fresh interpretation and Chef Eric’s creativity and bold authenticity will introduce traditional cuisine to guests in a brand new way”, says La Motte CEO, Hein Koegelenberg. Lunch at Pierneef à La Motte treats guests to a sophisticated à la carte menu within the restaurant’s elegant ambience, beautifully embraced by tranquil gardens. Chef Bulpitt’s selection of starters, mains and desserts changes with the season and the menu represents seasonal and sustainable, locally-sourced artisan ingredients. All dishes come with wine suggestions from an award-winning wine list offering both current and older vintages of La Motte, an interesting selection of other South African and international wines as well as an exceptional representation of Franschhoek Méthode Cap Classique wines. The à la carte lunch is served inside the restaurant and on the water deck, from Tuesday to Sunday, 11h30 – 15h00. Reservations are recommended. Welcoming guests to its culture of sharing, the Garden Menu is a brand new addition to the Pierneef à La Motte offering. Guests are invited to enjoy this more relaxed dining experience under the estate’s majestic oak trees during warmer weather, from October to Easter. Relish the calm garden ambience, enjoy a glass of wine and choose from an ever-changing seasonal menu of delicious sharing options. Despite its more informal feel, the Garden Menu echoes the à la carte menu’s theme of modern heritage cuisine. Expect unique South African tastes such as flavoursome Cape curries, mosbolletjies, biltong, curry lamb kebabs, cinnamon pancakes and all those interesting combinations of sweet, sour and savoury, presented with Chef Eric’s innovative touch. The menu offers guests a selection of smaller plates to enjoy with La Motte wines. Commencing in October 2018, the Garden Menu is served in the garden or on the Pierneef à La Motte stoep from Tuesday to Sunday, 11h00 – 17h00. (Last orders at 16h30). No Reservations. With the delightful confectionery of the Farm Shopalways a temptation, the La Motte gardens also offer a beautiful opportunity to sit down with a glass of the estate’s award-winning Méthode Cap Classique, coffee or tea and a choice of delectable bakes. The La Motte Farm Shop is open from Tuesday to Sunday, 09h00 – 17h00. 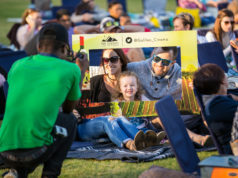 The La Motte Wine and Food Tasting is one of the motivations behind the estate having been announced the winner an exceptional four times, in the Drinks International Wine Tourism Best Food and Wine Matching Experience. As part of the renewal in the restaurant, the menu for the La Motte Wine and Food Tasting has also seen a complete transformation. 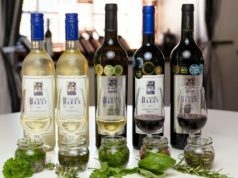 The food pairings support the restaurant’s focus on modern heritage cuisine, curated with the input of Cellarmaster Edmund Terblanche to complement the five La Motte wines in the tasting. The food tasters are delicately plated but still represent everyday flavours and tastes and will guide guests towards more reliable food-and-wine selections, with reference to weight and intensity, as well as the influence of the primary taste sensations. Presented by a well-informed Wine Ambassador, this Friday morning event is both educational and entertaining. 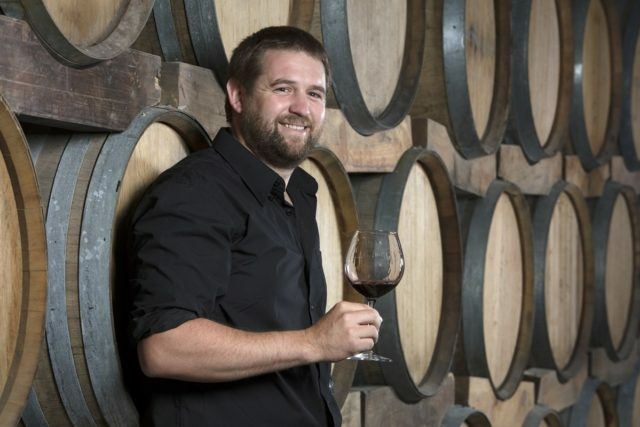 The La Motte Wine and Food Tasting takes place on Fridays at 10h00. R295 per person. Strictly by appointment only. Franschhoek spoils for choice when one is considering where to dine. 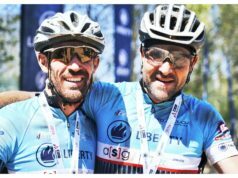 The best of South Africa appears to be concentrated in the main street and where to eat is not made any easier by La Petite Colombe’s winter special. Visitors can expect the same stellar standards in both service and cuisine, as they have come to know from world renowned parent restaurant La Colombe. The winter lunch special that is currently on offer at Le Petite Colombe has been described as a bucket list worthy! Artist Reason Ndlovu at work on one of his chocolate paintings. Perhaps one day they will have a section in the National Gallery devoted to paintings done in chocolate. 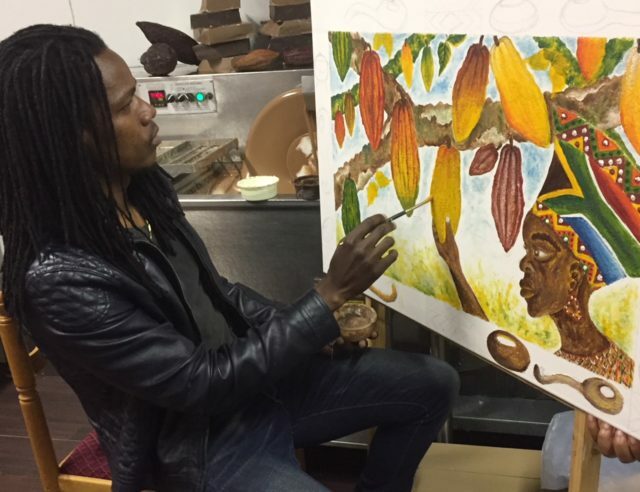 Well, so hopes Reason Ndlovu, a Franschhoek artist who has come up with an innovative idea – painting with chocolate. It all began when Danny Windvogel of Huguenot Fine Chocolates was walking in the main road and saw Reason doing painting work on a shop door. Their subsequent chat led them to the idea that the process of making chocolate could be illustrated by means of an artistic portrayal in a chocolate painting. A short time later, working on the premises, so that he had access to chocolate pods and pictures of the cacao botanical process, Reason began his two works which are almost finished and will have pride of place in the shop once completed. More than 60 percent of the world’s cocoa beans are grown in Africa, so it was appropriate that the painting should have an African theme. Stuart Downie and Leigh Courtnage purchased the ‘Co-op’ in 1997. This photo dates from the mid-1990s. Stuart Downie and Leigh Courtnage laid down the reins as owners of the PicknPay Franschhoek stores in May 2018, after 21 busy years in the Franschhoek retail sector. 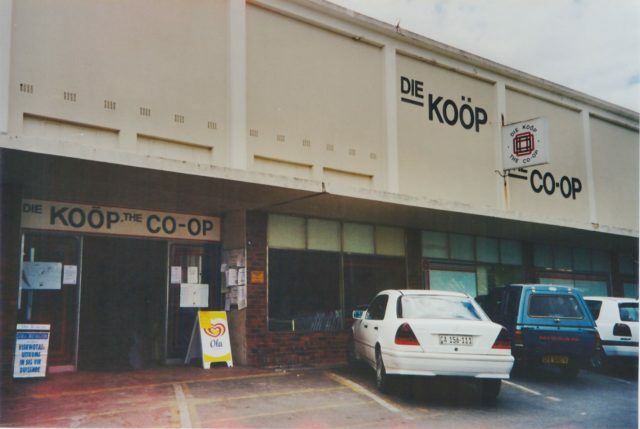 Their retail journey together started in 1996, when their paths crossed at the then Franschhoek Verbruikers Ko-operasie in the centre of the village, or the ‘Co-op’ as everybody knew it. They purchased the business and, in 1997, established the Village Supermarket. In 2003 they joined the Pick n Pay family. A Pick n Pay Liquor store was added to their business in 2009 and a Pick n Pay Daily store in 2010. Harvest 2018 is complete and Richard Duckitt, Chief Winemaker at Bellingham is enjoying a momentary reprieve. 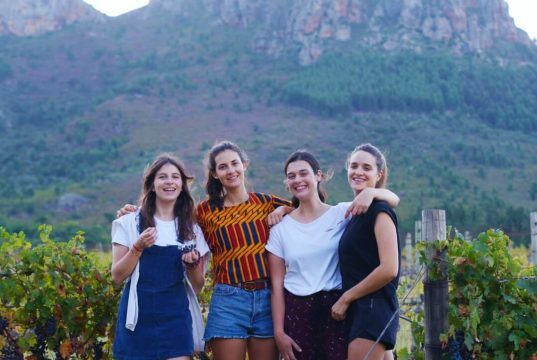 The Cape’s devastating drought played a dominant role in this year’s harvest: the Winelands were declared a disaster area and the outlook at the start of the vintage wasn’t a positive one. A plunge in yields was to be expected, but this fear was compounded with the effect the drought would have on quality – as lack of water during the critical veraison period can affect berry composition, and in particular sugar accumulation and concentration. 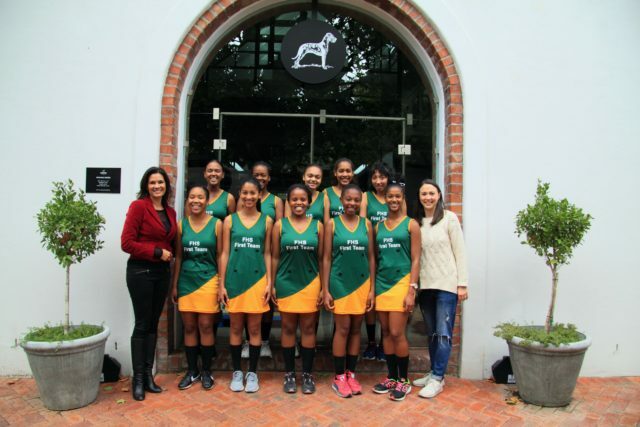 Amy Kleinhans (left) and Alrishka Macaskill (right) with the FHS first netball team in their new uniforms. Franschhoek High School’s first netball team is going into the netball season with brand new uniforms thanks to the generosity of Terbodore Coffee Roasters and a little help from local resident Amy Kleinhans. Amy’s housekeeper, whose daughter plays for the team, approached her to help find a sponsor for new uniforms as their old ones were in a dire state. Amy approached Michael Macaskill and the team at Terbodore Coffee Roasters and they immediately came on board as the anchor sponsor for the new uniforms. On 24 April the team and their coach met with Amy and Alrishka Macaskill to enjoy a coffee at the Big Dog Café and to show off their new uniforms. Their coach says the new uniforms are motivating the team to do well this season. Pniel Primary and Bridge House Prep faced each other in the final of the Groot Drakenstein Games Club’s Under-12 Cricket Tournament. 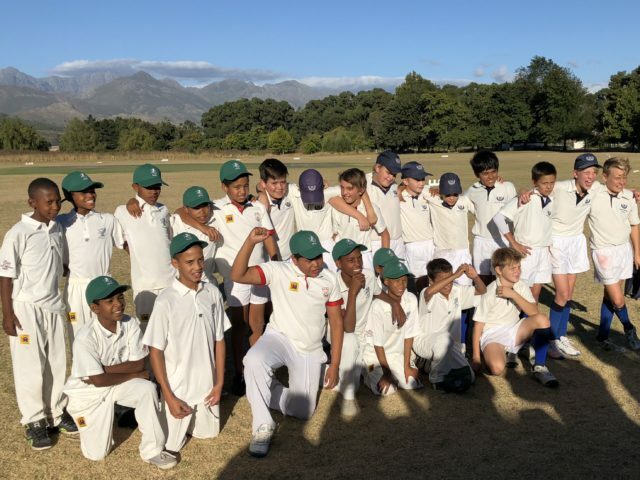 The Groot Drakenstein Games Club’s Under-12 Cricket Tournament, after eight weeks of round-robin, quarter and semi-finals, resulted in a very apt final between Bridge House Prep and Pniel Primary. 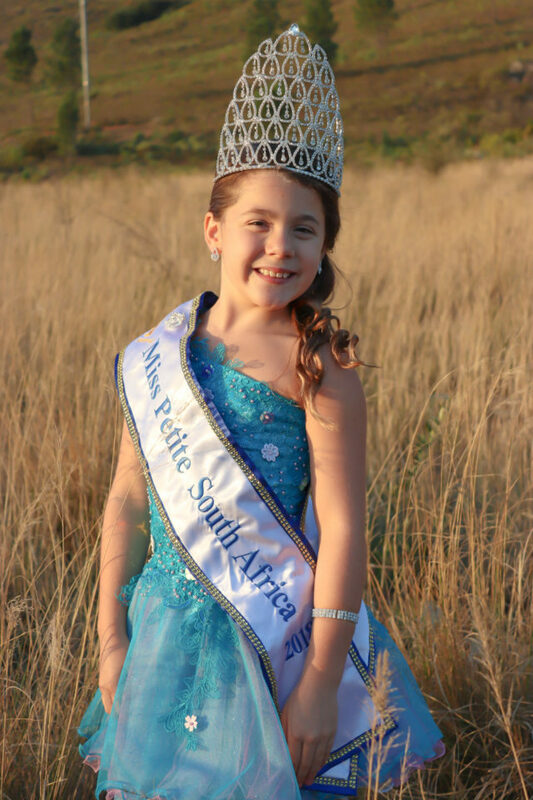 Sarah Ruth Eichler (8) who lives outside Franschhoek on the R301 was recently crowned Miss Petite South Africa 2018 in Pretoria. In May next year she is invited to attend the Little Miss Universe pageant in Turkey. This is how it happened. Last year Sarah was selected to represent the Western Cape as a Mr & Miss Junior South Africa 2018 finalist. She was one of nine 7 to 8 year olds from around the country in the Miss Petite age group. At the pageant the contestants were judged in different categories: casual wear, evening wear and interviews, and for fun there was also a themed wear round for which the organisers chose ‘Futuristic Sci-Fi’ as a theme this year. Sarah went as a futuristic ballerina. Dalewood Cheesery is perhaps not that big a business but they compete with the best and they score big. Regularly. 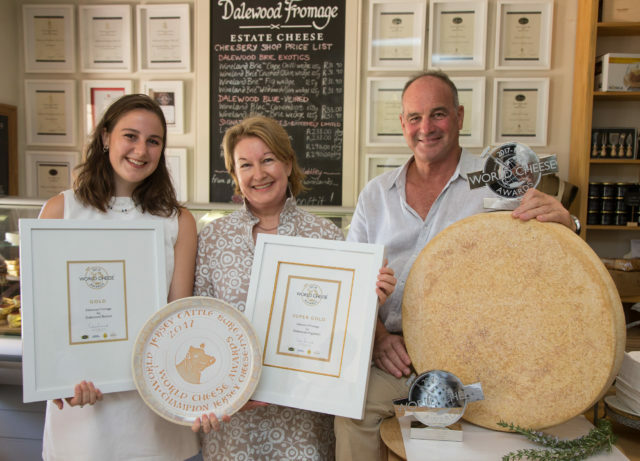 At an understated celebration on the farm recently the owners Rob and Petrina Visser hosted some important people who handed over the latest awards. Big ones.